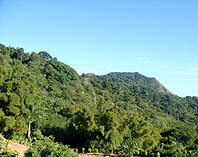 Adjuntas is nicknamed "the Switzerland of Puerto Rico", because of its relatively chilly weather and high elevation. 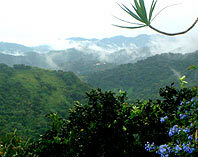 In Adjuntas the average yearly weather is 72 degrees Fahrenheit – Ideal for Coffee cultivation! In Hacienda Monte Alto we are devoted to cultivating high-mountain, high-quality Puerto Rican coffee, and this commitment plays an integral part in every aspect of our business. 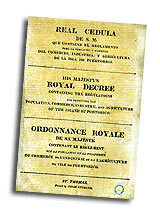 In 1815, the Spanish Crown issued the Royal Decree of Graces (Real Cedula de Gracias) fostering the immigration of Catholics of non-Hispanic origin to the Caribbean Colonies in the New World. Spain had lost the entirety of her territories in South America and Central America and sought measures of preventing a repeat of this in Puerto Rico. By the mid 1800s, the highland municipality of Adjuntas, enjoyed an influx of immigrants from the Mediterranean islands of Corsica and Majorca. Some established coffee plantations in the highlands of Puerto Rico in the municipalities of Adjuntas and Yauco. During the last decades of XIX century, the excellent coffee produced in Adjuntas was exported to Europe, the United States and even the Vatican. For over a century this high mountainous region was world famous for producing some of the finest tasting coffee in the world. In the early 1900’s, Baltazar Román, the great-grandfather of today’s generation of Románs, purchased the 400 acre coffee plantation, “Hacienda Pellicia” in Adjuntas and began cultivating coffee. Baltazar’s son, Ramón, followed his father’s footsteps and became “Mayordomo” (foreman) of the plantation, later establishing a “Beneficio” to process and dry green coffee for “Hacienda Pellicia’s” harvest as well as surrounding coffee “Fincas” and “Haciendas” in the area. In 1978 Gilberto Roman, better known as Don Jimmy, purchased what is known today as Hacienda Monte Alto. 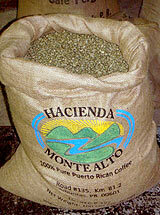 Since its beginnings, the Hacienda has been involved in the cultivation and production of coffee. In 1984, six years after the acquisition, Don Jimmy decided to establish a “Beneficio” (coffee processing plant) and started processing and drying Green Coffee from his farm. As the word got around, small scale farmers from surrounding mountain estates began bringing their coffee harvest to “Don Jimmy’s” Beneficio”. Today Hacienda Monte Alto exports its world class, specialty grade, green coffee to the U.S. and internationally. Every shipment of specialty green coffee is selected by size, density and hand sorted. Each lot is graded following the SCAA Green Coffee Grading Protocol. Hacienda Monte Alto is strongly committed to produce the best coffee in Puerto Rico “Our goal is to continue the good agricultural practices and the commitment to quality that has always distinguished Hacienda Monte Alto”, says Don Jimmy, “and restore the past glory that which was once one of the most cherished coffees in the world, Puerto Rican highland coffee”! Hacienda Monte Alto practices better planting techniques for managing soils in its’ coffee plantation by planting on contours around hills and spacing the trees so that they are staggered up hillsides, thus dramatically reducing erosion. HMA conducts soil analysis before agricultural practices such as pruning; weed control and fertilization are carried out. Our coffee grows in the shade of other trees like Banana trees and Exotic hardwoods. This bio-diverse environment provides several crops for harvesting while protecting the planted species from pests and disease that are prevalent in mono-culture agricultural methods. Our farm is like a forest that provides habitat for beneficial insects, birds and nitrogen fixing plants. Hacienda Monte Alto is mindful of the importance of utilizing techniques, processes and equipment that contribute to an eco – friendly, sustainable operation. To this end we are constantly evolving our approach to socially, responsible coffee cultivation and processing. Our most precious resource. HMA’s water source comes from deep mountain aquifers. Often, in the case of coffee processing, unnecessary amounts of water are consumed. To improve water management in our coffee production, HMA has invested in new technology, ecologic equipment to decrease water use in the coffee de-pulping process. Sustainability and energy conservation is The Future for coffee processing at HMA. With every new investment of equipment, the ecological impact is always a deciding factor as to which direction we should follow. Sustainability and efficiency are our guiding precepts. Our green coffee Dryers use state-of-the-art drying method efficiencies that operate with reduced fuel consumption. 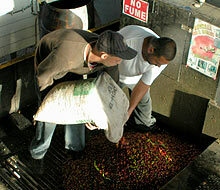 Coffee drying waste by-products are used as combustible fuel. We operate Ecologic De-Pulping equipment that uses greatly reduced amounts of electric energy. Small-scale farmers, inexperienced in global trade and markets, rely on their partnerships with Hacienda Monte Alto to lend critical organizational development assistance to the farmer in ecologically friendly cultivation practices such as shade grown and bird-friendly coffee and participating in fair trade initiatives. Because of HMA’s mission to produce and market premium and specialty coffee, the local farmers in Adjuntas become enthusiastic, knowing that their additional efforts will be rewarded by earning better prices. The experience of HMA’s Beneficio, illustrates both the potential benefits of fair trade, responsible and ecological cultivating practices and the challenges of making these benefits sustainable. 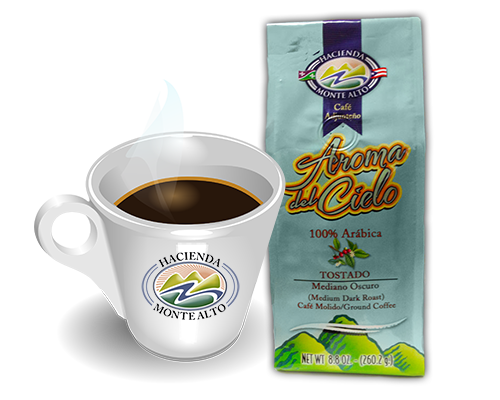 We are located in the heart of the central mountain range of Puerto Rico in the town of Adjuntas where altitude, climate and soils provide the perfect conditions for growing one of the best coffees of Puerto Rico. The Mountain mist has an effect on the ripening process, slowing it so the coffee bean has more time to develop its favorable characteristics. 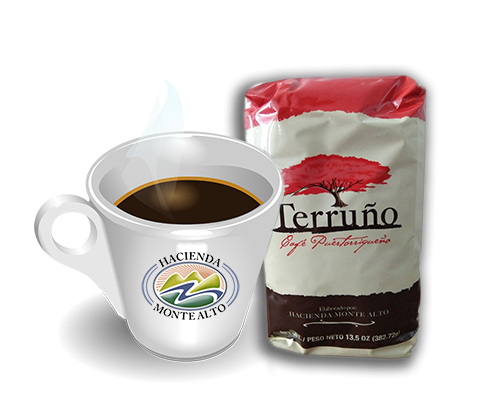 Cool temperatures in the Adjuntas Mountains (from 60 to 75 degrees) and rainfall patterns are ideal for coffee. Put all this together and you've got the most sought after coffee in Puerto Rico! 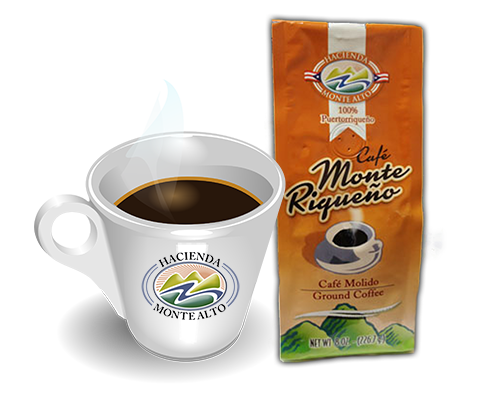 Hacienda Monte Alto is a family owned business that works with the entire spectrum of coffee production. Our business includes coffee nurseries, coffee farming, coffee processing and exportation of Green Specialty-Grade Coffee.coffee roasting. In the near future, HMA will begin roasting, packaging and distributing premium coffee products to the retail food industry in Puerto Rico and internationally. In Hacienda Monte Alto we are committed to quality and it plays an integral part in every aspect of our business.